Stakeholders from the public and private sectors convened in Rome from 21st to 23rd November for the fourth Smart Grids Innovation Workshop. 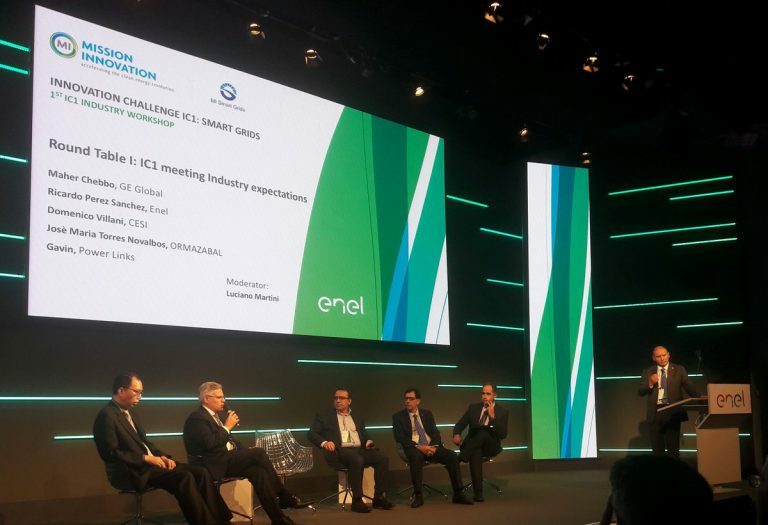 The event included the first Smart Grids Innovation Challenge Industry Workshop, involving speakers from many industry representatives including ENEL, GE Global and Power Links Technology Limited*, and the launch of the Smart Grids Innovation Accelerator (SGIA). The SGIA platform will encourage the development and upgrading of smart grids by sharing results from pilot projects and consolidating best practice. The Smart Grids Innovation Challenge (IC1) is one of the eight ICs under Mission Innovation (MI). The main objective of IC1 is to accelerate the development and demonstration of smart grids in a variety of grid applications, including the robust, efficient, and reliable operation of regional grids and distribution grids, as well as micro-grids in diverse geographic conditions, to improve the uptake of electricity generation by renewable sources. On the first day the workshop brought together government representatives and technical experts for an internal IC1 meeting. The second day was dedicated to a workshop with industry including round table discussions with industry leaders. Sixteen industry success stories about smart grids innovation and public-private cooperation were presented as excellent examples of the ongoing significant innovation effort made by large, medium and small enterprises paving the way towards future collaborations. The presentations can be downloaded from the event website. The round table discussions between IC1 members and industry representatives confirmed the strong commitment of the IC1 members to engaging with the private sector to accelerate the adoption of innovative solutions. The SGIA Platform was launched on the second day. The platform will serve as a tool to enable knowledge sharing of technical results and best practice, thus removing barriers and providing insights to boost smart grids market uptake. On the third day the workshop was open to the public, with speeches by high-level Ministry and government representatives from the co-leading countries China, India and Italy and presentations by the IC1 members. The aim of the workshop was to define future actions and strategies as well as to reflect on the results of the international collaborative activity catalysed by IC1. To conclude the meeting the IC members approved the Rome declaration stating their continuing commitment to strongly support the ongoing fruitful collaboration in IC1 and recalling major accomplishments and agreed near future engagements. Furthermore, as part of IC1’s strategy to sustain its present excellent track record and the ability to leverage both internal and external partnerships for maximum impact, a Letter of Intent between IC1 and the International Smart Grid Action Network (ISGAN) was signed by the three IC1 co-leads to promote a fruitful collaboration and reciprocal support. *Other presenting organisations included 3M, ABB, CESI, CISCO, ELECTRON, IBM, Ormazabal, Schneider, SEC, SIEMENS, and TERNA. The presentations can be found here. COP24: A clear road ahead towards the Paris Agreement goalsThe countdown to #CEMMI2019 has begun!